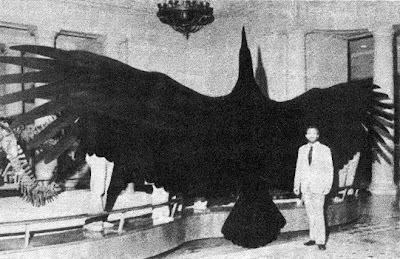 This is Argentavis magnificens, "the magnificent Argentine bird", largest flying bird ever discovered, larger in every aspect than any other flying aves, including even the enormous Haast's eagle. Bone structure analysis (the basis of this card-board approximation) suggests the bird flew by soaring, flapping its wings as rarely as once an hour to retain lift. 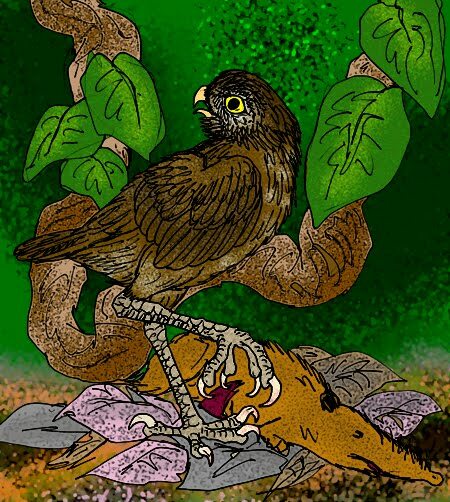 The Argentavis required a runway in shape of a mountain slope or a hillside for take-off, since it is physically impossible to lift its 70 kg body weight in one flap. In comparison, the Wandering albatross weighs a measly 10 kg. The Argentavis was a scavanger, using an enormous size advantage to chase lesser land predators away from their prey. A single specimen could live up to a hundred years. The Argentavis is an extinct species of Pleistocene megafauna, with fossils discovered exclusively in the Argentininian Andes. Closest living relatives include the Condor genus, though the Argentavis belongs to a different family - the Teratorns. All these "monster birds" became extinct in the late Pleistocene, correlating with the arrival of humans on the continent of South-America. Unlike most of the following species, human involvement in its extinction is highly disputable. The Argentavis was simply too large for this world. ...because here comes the Megatherium. Closer inspection leaves one puzzled - on its hind legs the Megatherium was as tall as three elephants stacked on top of each other; it appears to be a mammal, one that became extinct no more than 10,000 years ago, and was endemic to South America. But what was it? It was giant something, but a giant what? Do you know what a sloth is? It's that lazy little tree-dwelling mammal that's not exactly an ape, but is instead related to the ant-eater. It has claws and it uses them to rake in leaves. Now take a closer look at this Megatherium's hands. Do you see the claws? Do you see what it's doing? It's eating leaves, isn't it? 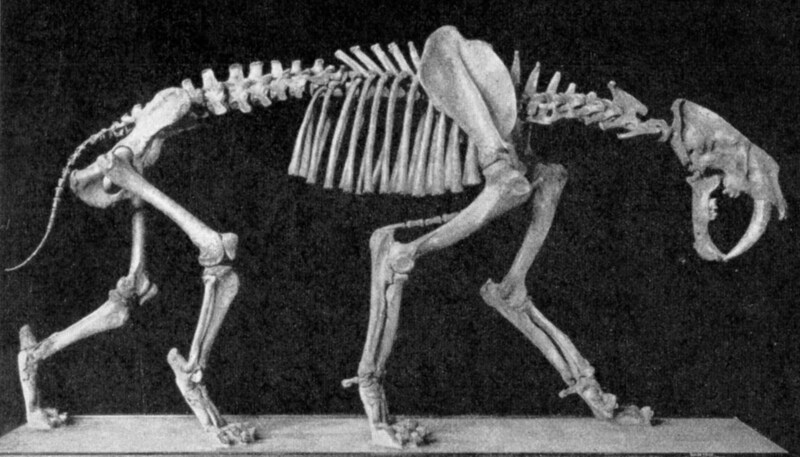 The Megatherium, along with a plethora of other ground sloths, once made up the bulk of large North and South American mammals. Had they made it to modern times, we would most probably view them as a kind of American analog to the elephant. Yet they did something the elephant can not - a giant ground sloth could rise to its hind legs, using its muscular tail to form a tripod. This enabled it to reach extremely high lengths, pulling down branches of leaves other ground animals could not reach. It is often thought another legendary extinct member of Pleistocene megafauna - the Smilodon or saber-toothed tiger - hunted the Megatherium. Yet no predator could out-weigh this particular 6-ton beast. 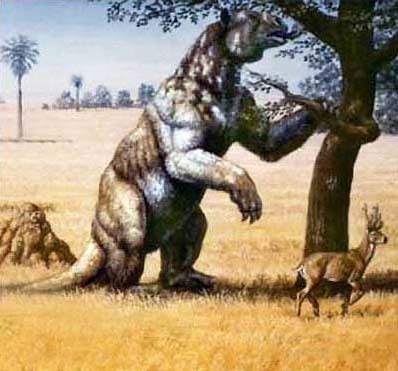 It is true, however, that Smilodons hunted smaller giant ground sloth species. An adult Megatherium, however, was hunted by no one. Instead we find Glyptodon fossils that died on their backs. This hints at Megatherium scavenging or hunting this animal, as no other known animal existed in South America during that period that could flip an adult Glyptodon. Glyptodon was a large, armored mammal of the family Glyptodontidae, related to armadillos. Flatter than a Volkswagen beetle, but about the same general size and weight, Glyptodon is believed to have been an herbivore. One might notice a superficial resemblance to Ankylosaurs, the tail-wielding tanks of the Age of Dinosaurs. 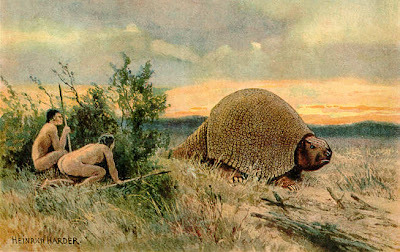 The Glyptodon, however, is a very recent mammal, and thus an example of convergent evolution - it had acquired the same biological traits as an Ankylosaur, yet it belonged to an unrelated lineage. This lineage being the superorder of Xenartha, currently comprising of Sloths, Ant-eaters and Armadillos. As giant ground sloths already demonstrated, this particular group used to be more wide-spread in the Americas. Most striking of its sauroid traits was the Glyptodon's armor. Before the first widespread human habitation of the Americas, during the end of the last glacial period, around 16,500–13,000 years ago, the Glyptodon used to survive by being, quite simply, un-flippable. That is, un-flippable by anyone but the largest giant ground sloths. Alas, this strategy excluded the possibility of Newtonian science. Paleo Indian newcomers quickly learned to employ leverage as a mechanical advantage - give me a lever long enough and I will move the Earth itself! By a familiar twist of fate, it was the shells themselves for which the Glyptodon was hunted to extinction. For Paleo Indian hunter-gatherers, they made perfect shelters. Imagine the strange and unfriendly Pleistocene wilds of South America, a continent sprawling with monsters and giants now long extinct. Imagine the Amazon, a place where the gods themselves were taken aback by the horror they had brought into the world, leaving creation unfinished - a popular myth among many South American tribes. Now imagine the warmth and shelter of a familiar Volkswagen beetle. To your left lie the skeletal remains of a Smilodon populator, "devastating sabre-tooth", largest species of the Smilodon genus, heaviest feline ever to walk the Earth. The populator weighed in at around half a ton. If one were to take a closer look at its short hind legs and powerful front legs, the arching shape of its vertebrae, one might notice there's something different about this large cat. The populator seems more bear-like than its graceful living relatives. This is because all sabre-toothed cats belonged to a sub-family of felidae that was neither pantherinae, (Tiger, Lion, Jaguar, Leopard) nor felinae (Cheetah, Leopard, Lynx, Domestic Cat et al), but a third, now entirely extinct sub-family of felidae called machairodontinae. 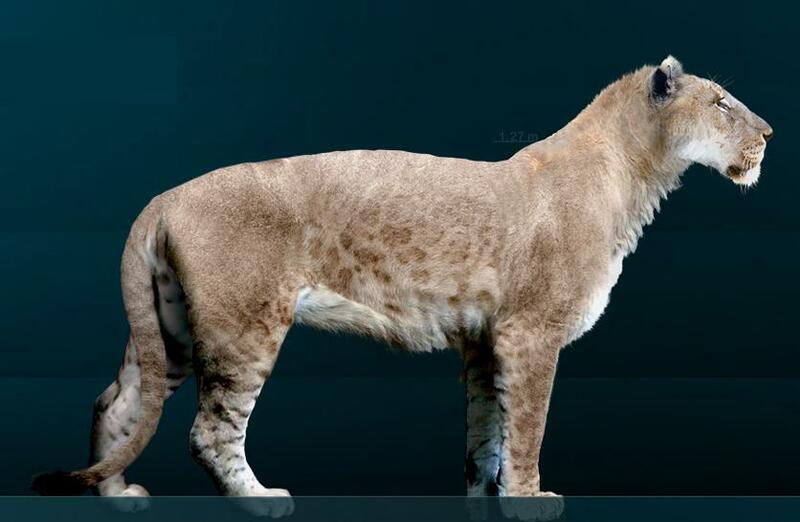 These large cats were considerably more bulky and less graceful than cats today, plus they had elongated canines. Though the best known species (populator and fatalis) were endemic to the Americas, sabre-toothed fossils appear all over the world, from Africa to Asia. Although one can't shake the feeling that there was something special happening in the Americas. Here sabre-tooth cadres were reinforced with the likes of the Nimravidae (the "false sabre-tooth tiger" - neither a feline, nor a bear) and the Thylacosmilus, a marsupial (!) sabre-tooth tiger. All lineages stop at around 10,000 years ago. If the populator was the heaviest feline ever to walk the Earth, perhaps there was a species that weighed less, but was in fact larger in size? Behold! - Panthera leo atrox, the American lion, 4 meters long, as tall as an adult human male, largest lion in history, became extinct 11,000 years ago. It is extremely difficult for me to overstate the sheer amount of respect I have for Pathera leo atrox. I want to die at the hands of this animal, I want the American lion to crush my skull between its jaws, I want to leave the Earth in laughable, hopeless, immeasurably inferior opposition to this epitome of a superpredator. I don't want to discuss keynesian economics with you, friend, I want its teeth in my brain. I don't want to go on a safari, I want to have a heart-attack before an Arctodus simus mows me down. 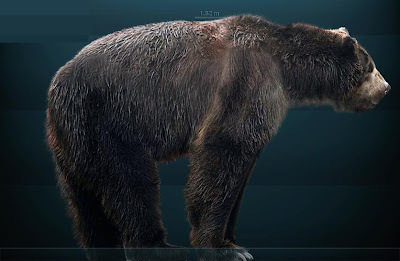 Arctodus simus, giant short-faced bear, second largest mammal land predator of all time, endemic to North America, became extinct 11,500 years ago, was the last known hypercarnivore. Remember when I told you no one hunted the Megatherium? I lied. A hypercarnivore is a predator that predates herbivore species specifically adapted to be un-predatable. The only means for a herbivore to achieve this untouchable status, is to outweigh all predators. These herbivores were the Megatheriums, the American Mastodons, the Woolly mammoths - animals so large, it would be extremely unpractical for a predator species to become large enough to take it down. 1 ton appears close to the size limit of carnivorous land mammals, relating to available food as well as metabolic requirements. And then there's Arctodus simus, walking the thin line between niche adaptation and insanity, weighing in at around 1,2 tons, capable of felling an adult mammoth. There are no living hyperpredators, fossil records suggest only a few have existed after the Cretaceous-Tertiary Extinction event took out the dinosaurs: Ursus maritimus tyrannus, ancestor of the Polar bear, largest mammal land predator of all time (100,000 years ago); Andrewsarchus, an hyena-like omnivore with jaws 70 cm long, closest living relative - the whale (35 million years ago); and the Sarkastodon, a Mongolian hypercarnivore of the of the order of Creodonta, because not all meat-eaters have to be of the Carnivora order (40 million years ago). It is in this pedigree, that the Arctodus simus met its Paleo Indian demise. What happened? What could possibly have contested with this killing machine? It's called the "pre-historic overkill hypothesis." Backed up by a variation on its theme, the "secondary predation hypothesis", it is currently the leading explanation behind the Quaternary extinction event, a sudden mass extinction of large land mammals at the end of the last ice-age, 12,000-10,000 years ago. And this is how it plays out in the Americas. By now the Megatherium would have no Glyptodons to flip over - which would be a considerable problem, were the Megatherium not extinct, along with all prevalent herbivore species on both continents. Leaving the Arctodus simus, the American lion, and the Smilodon populator - as well as any other large predator - without the bulk of its prey. About this time the fore-mentioned secondary predation hypothesis would kick in. You see, "overkill" is such a simple word. Killing an ant with a flamethrower is overkill, as is, for example, a nuclear land mine. Its results are a bit trickier. r/K selection theory sees all species as trading between quantity and quality of offspring. Megafauna - especially predatorial megafauna and its crown achievement, the apex predator - almost exclusively chooses the latter. The Smilodon populator was thus a K-selected species, opting to go for quality. Such species are strong competitors in crowded niches, and they invest more heavily in fewer offspring, each of which has a relatively high probability of surviving to adulthood. Along with that certain je ne se quoi that makes young men want to die by their hands. Which goes to say they tend to inspire awe. When you're an hypercarnivore on a continent without the very prey your fringe strategy was based upon, it's an open and shut case. But even if you're able to switch to smaller prey, for the likes of the American lion, competition with lesser yet more adaptive predators like wolves will almost always mean extinction. Good-bye scimitar cat, good-bye Xenosmilus. That, in a nut-shell, is the secondary predation hypothesis. I leave you with my good friend Ornimegalonyx oteroi, the Cuban Giant Owl. Standing at around 1,1 meters, the Ornimegalonyx was a giant flightless owl that lived in Cuba, 10,000 years ago. Sometimes also called the Giant Cursorial Owl, because it ran very, very fast. Consider the Ornimegalonyx a sort of cross between an emu, a stork and an owl. What it liked to do, was ambush its prey. The Cuban Giant Owl would sit in a tree, night vision on. And then it would suddenly drop on you, using its vestigial wings as a sort of parachute. Next time, join me as we explore the rest of the planet before and during the Quaternary Extinction Event - an overture to the Holocene extinction, always looming on the horizon. Expect this as well to be an undertaking of the monotonous kind, accompanied by the same old funeral dirge - overkill from New-Zeeland to Africa. PS About that pale shadow in the headline, John, just take a look outside. Why not get lost in the woods? Nothing will happen, nothing is there. Just some ants, some rats and a wolf. Tähelepanuväärselt kehv poliitiline otsus on väljasuremiseni küttida kõik oma kontinendi kodustatavad loomad, eriti hobused, et siis 10,000 aastat hiljem avastada, et portugallased ei ole niimoodi teinud. Misjärel - õhus on tunda järgmise väljasuremise kibedat lõhna. suur lind ei ole eriti mage. kas see on komposiitsoomus, mis seda sõjanuiaga suslikut katab? ma arvan, et kui seda AD&D terminites käsitleda, siis on pigem tegemist plaat-turvisega. See koosneb üle 20,000 väiksest plaadist, mis on jäigalt teineteise külge seotud. Selle kõige külge on jäigalt seotud susliku enda selgroog. Vastupidiselt reptiilist kilpkonnale, kes kasutab sarnast turvist, ei saa seenud Doedicurus oma pead kilbi alla peita. Küsimus, mis siin võib tekkida on: oot-oot! see tüüb on IMETAJA?! Kuidas kurat selline tüüp üldse midagi imetab? Milline näeb välja sellise tüübi kutsikas? Fan-art. Kõhu alt on paljas, it seems, nagu siilikeselgi. Ui... Pisike Glyptodon clavipes on nunnu. Eraldi väärtus on see, kuidas tänapäeva inimene saab 18 minutiga produtseerida mitte ainult vastuse või isegi illustratsiooni vaid lausa fan-arti mingile nii obskuursele küsimusele. Eks see ole ka vägev pleistostseeni megafauna. Ma arvan, et Kõikide Imetajate Eellase, rotisuuruse putuktoidulise looma, kes hiidsisalikud üle elas, kohta on tunduvalt vähem fännikunsti leida. Minu tavapärane otsus: suitsetada räigelt ja vaadata, mis seisud za/umis on, tasus taaskord ära. These fuckers are amazing! Now back to "Monster Fish" on Nat Geo Wild! Peab ausalt ütlema, et see on kadestamisväärne hommikupoolik. Lahe ülevaade, ootame jätku üle kontinentide ja ajastuste. Loodan et üks 10 aasta jooksul saab neid peltsebule DNA-jäänukitest uuesti tehtud. Kujutan juba ühte sellist lindu ette Snelli tiigi pargis tatsamas. Jõudsid ka läbi lugeda, napilt enne pealehelt kadumist? Nice. Kui selles oli Pleistotseen (no vapšjee ei oska seda eesti keeles kirjutada...) Ameerikates, siis järgmine tuleb ülejäänud maailmas - Ameerikatega nimelt on liigirohkuselt hästi. Misjärel tuleb juba Holotseen (sic?) ise ja tema "lähiväljasuremised". Ilmselt ka kahes osas. Viimase osa pealkiri saab mingi eriti šeff olema aga ma ei lobise seda praegu välja. Totaalselt niimoodi ongi eesti keeles, mine putsi!